Mycobacterium tuberculosis, the etiological agent of tuberculosis (TB), can persist for years and even decades in the lungs of its human host. Researchers at the Institute of Pharmacology and Structural Biology (IPBS - CNRS/Université Toulouse III - Paul Sabatier) found that a unique M. tuberculosis gene cluster involved in the synthesis of the molybdenum cofactor, a cofactor for several oxidoreductases including the nitrate reductase, allows this major pathogen to respire nitrate and to persist in a dormant state under hypoxia, a stress condition encountered in lung TB lesions. Strikingly the M. tuberculosis ancestor, which most likely was an environmental harmless bacterium, acquired this gene cluster, together with its hypoxia-responsive transcriptional regulator, horizontally from neighboring bacteria. These results uncover a key step in M. tuberculosis evolution towards pathogenicity. This study is published in PLOS Pathogens, on November 27 2017. 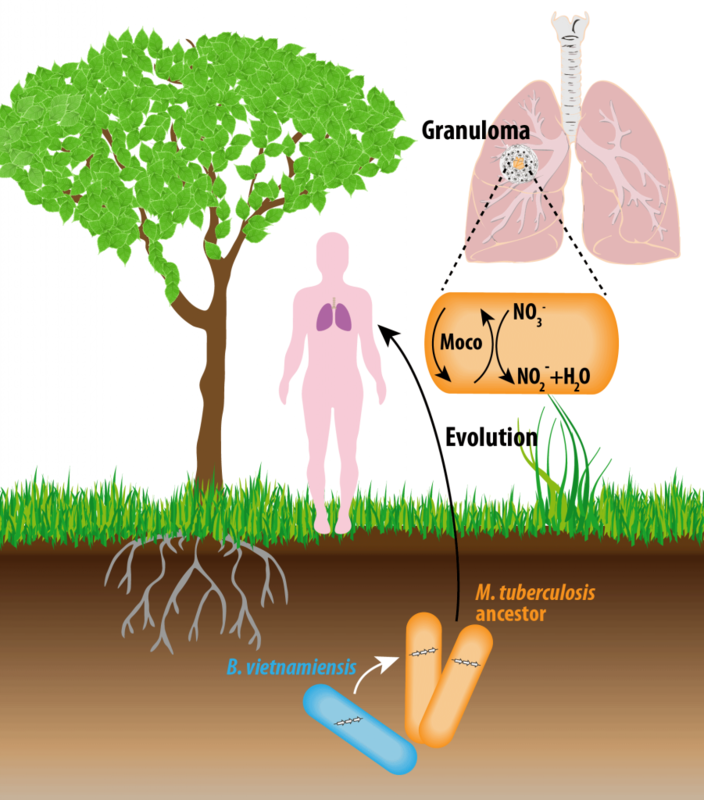 Horizontal acquisition of a group of molybdenum cofactor-encoding genes by the Mycobacterium tuberculosis ancestor from Burkholderia vietnamiensis or a close relative enabled M. tuberculosis to respond rapidly to hypoxic stress encountered in lung granuloma where it survives in a dormant state thanks to nitrate respiration.